For a creative twist on the traditional guestbook we asked all of our guests to "leaf" their names on our family tree. I instantly fell in love with these textured table clothes while going through a slew of samples. In lieu of a traditional table runner we opted for a mirror runner down the center, which reflected the candlelight beautifully. Our bridal party got very creative with their grand entrances to the reception, even I couldn't believe the mad dance skills taking place. Maid of Honor and Best Man speeches. Abby's shining moment "When I was little I used to tell all my friends that Justin was my brother, but then when he started dating my sister, it got a little awkward... Glad I can finally call you my brother again!" Ryan's best moment... dropping his notes halfway in. Winging it is always more entertaining! My dad is such a good sport. Case in point, I asked him if he would ever do a crazy choreographed father/daughter dance with me and his response was, "I'll do whatever makes you happy." So of course I jumped at the opportunity and our guests were shocked when we broke into dance from our "Isn't She Lovely" decoy song! The tear jerker of the night was when Justin surprised his mom with "Somewhere Over The Rainbow" for their mother/son dance, which was his grandmother's favorite song. You may remember me sharing some of the hilarious photos from our photo booth here. We had a table with scrapbooking supplies where our guests could leave us their crazy pictures and sweet messages. The final product is a hilariously special scrapbook that we will cherish forever. 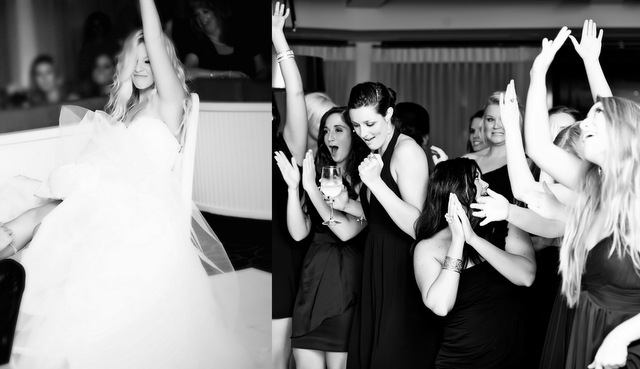 The Garter Switch: The girl who catches the bouquet sits down, while the guy who caught the garter gets blindfolded. Then you secretly switch the girl for a grown man. When the other guy goes to place the garter on, the fun begins. Shania Twain's "Man! I Feel Like a Woman" made for the perfect soundtrack. After our mock leave, I was whisked away for a costume change. A little white mini with a dramatic shoulder paired with diamond covered Giuseppe Zanotti's created the perfect ensemble to dance the night away. Justin and I had a blast dreaming up and designing these Do Not Disturb signs and custom t-shirts for our guests to take home at the end of the night. I can't thank you all enough for your amazingly sweet e-mails, tweets and comments. It's been a blast sharing all of the special details with you. I'll be sharing more images on my Facebook page later today so be sure to follow here. Don't forget to check out the feature about you I did today on my blog! Congratulations on such dreamy and lovely wedding! Everything looks perfect and the cake is outstanding. It looks absolutely fabulous. Your such a lucky girl!! I am wishing you all the happiness of the world!! AMAZING!! You are stunning and your wedding was perfect!! Thank you for your lovely comment!!! I follow you too!! Anna, this is a gorgeous conclusion to your wedding week. You've had me glued to the screen. I'm so happy for you. I love the scrap and snap idea. Everyone looks like they had a blast. this is so lovely!! you are making me so excited for my wedding!! Weddings in the US are just so different from the ones in Europe... it really makes me jealous! You had so many creative ideas: the scrapbook, the Do Not Disturb sings... and you looked lovely! Congratulations! Cute pictures, looks like a magical wedding! Absolutely beautiful! Love the garter switch idea. Such a fun twist! Your wedding just kept getting better and better. I loved reading all these post this week. You are such a great inspiration. What a magical perfect wedding! I've loved seeing all of your beautiful pics. They are truly amazing. You looked absolutely gorgeous! Thanks for sharing your special day. Anna the pictures of your wedding are simplya amazing. I hope one day to get married and also live such a special moment!! I've just discoverede your blog but ove your style so you have one new follower on GFC. Hope you follow me back too!! I'll wait for your comments!! love the idea of a mirror runner! this all looks like so much fun - exactly the way a wedding should be. congrats again! This looks like the most fun wedding ever. I'm sure everyone's been telling you this, but it's all so pinterest worthy. You should be a wedding planner, seriously. Looooooooove your second dress and heels. You and Justin both look so gorgeous and happy. I really like the paper flowers. Where are they from? What a great idea to give shirts and a do not disturb sign. I've never seen that done before. Great pictures, girl. Loved this week's post. Such perfection! Love your pictures! I have loved all your wedding posts! You got some really amazing photos. Definately gives me so much inspiration for my own! amazing pictures and you cake is a dream!!! Wow this post is perfection. You nailed your wedding look. I hope I can look this beautiful on my big day. I am in love with the do not disturb signs! That's really a very creative and awesome idea! You had a photobooth? OMG. Jealous. What an brilliant idea. LMAO, "Man I feel like a woman" that's the funniest thing ever. I've never seen that done at a wedding before. haha. looks like you guys had a ball. Definitely one of the prettiest wedding's I've come across. The cake looks fantastic. Well done, hun. I'm impressed. I just read all your wedding post and looks like a complete fairytale. Everything looks perfect, it would have been perfect for my wedding. It's just sad that everything comes to an end so quickly and when you realize, your wedding day is over. Looks a great do! Thanks for sharing your special day with us Anna. your reception was absolutely breath-taking! 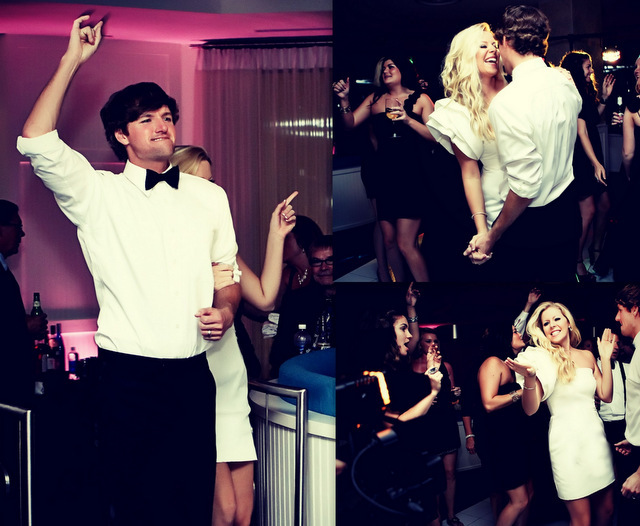 I adore that photo of you when you have your hand in the air and he's taking off your garter, too precious. All of your pictures are amazing!!! You looked gorgeous (as usual)! Looks fabulous girl! I just know that you had the best time. Thanks for your comment and for sharing these wonderful pictures! Love everything down to the Do Not Disturb signs so cute. Keep checking out our blog and we will definitely keep up on yours! Everything looks so lovely...glad you had a wonderful day and congrats on your new life together! What a fantastic event! Everything looked so perfect for your big day and the pictures are absolutely stunning! Thank you for sharing and cheers to your happily ever after! Love the blue shoes, and the cake! And the guestbook, what a cute poster! Wow! Your wedding was gorgeous! I'm so glad you shared this with us. 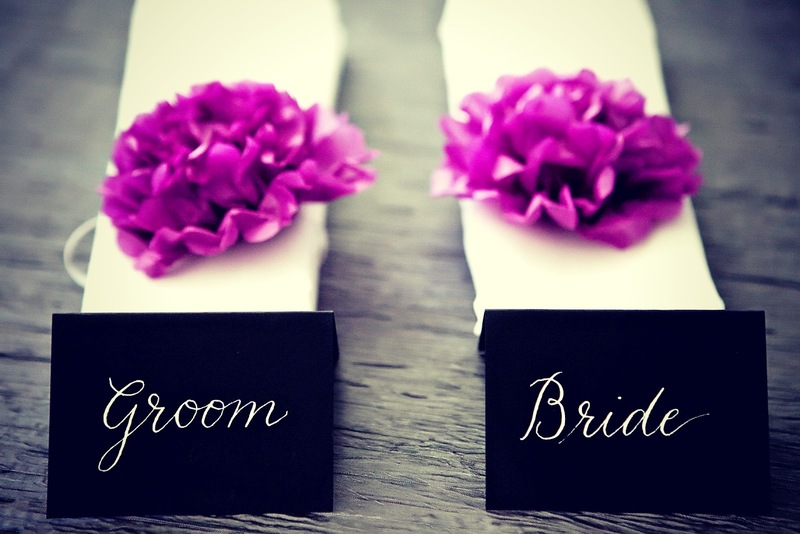 Love the details of your wedding! Your pics turned out amazing! did you take a photo of these? they are amazing! Looks like it was a blast of a wedding - all the best to you & your husband! I can't believe how fabulous every little detail of your wedding was! You looked stunning! Congratulations!!! OMG your wedding was AMAZING!!!!!! And you couldn't have been more beautiful. I completely teared up on the mother/son dance! Love those moments. Your wedding was beautiful and you looked gorgeous! OMG this is so beautiful you had a fabulous wedding, looking stunning in both dresses. I wish you and your husband all the happiness in the world! I can't stop gushing over your wedding Anna....everything seems sooo perfect! Gorgeous!!! 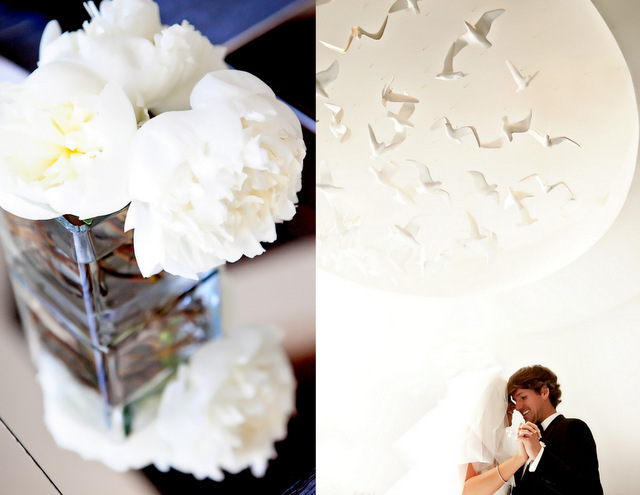 I love the first pic...and the cranes, beautiful wedding! First of all I wish you the best for you and your husband! Everything are gorgeous!Your wedding dress, your dress after, the shoes! Love the purple and white theme! Have a nice time and good start! It is definitely one of the best weddings I've ever "seen". Everything was amazing. I'm sure your guests and friends were really satisfied, and had lots of fun. With all those fantastic pics, it felt like we were there with you on your big day! holy moly i have loved EVERYTHING on your posts this week!!! your wedding, you and everyone involved just look absolutely stunning!!!! thanks for sharing with us! the cake look yummy!!! I wish you all the best!!! Wow, your reception looked absolutely amazing! So gorgeous and looked like it was a blast. Thanks for sharing your details with us this week!! so adorable! love the costume change!! I love everything about your wedding. The photos are gorgeous. CONGRATULATIONS! Im followin you from now on! WOW love. this was absolutely BEAUTIFUL!!!! CONGRATULATIONS! I love a the little details! These photos are so beautiful and magical! It was so nice looking through them, thank you for sharing! It looks like it was the perfect day! The photos are amazing and you look stunning in every single photo! I LOVE all the details and photos. The mirror runner is so pretty and your Dad is real good sport, would have loved to see video of the cute dance :) I'm glad your wedding went off so great and without any hitches. Oh my gosh, this just looks soooo amazing! Your wedding and reception looked amazing! You and your hubby make an ultra sweet couple! Amazing photos, and you look stunning! Looks like the wedding was a success and everyone were enjoying themselves. Congrats sweetie! You guys look like the sweetest couple ever. Love all of these. Amazing dear, e wedding looks like a fairy tale you guys look lovely together, I hope you have many happy years to come and I'm in love with your wedding dress and cake yum !! So incredible! I love every single part of it! Amazing... and the part about the mother son dance made me tear up too! Breathtaking. Loved every bit of this week. What a fun-filled reception! I love the "snap and scrap" idea and the "do not disturb" signs! So cute! Your second dress was gorgeous as well! lovely wedding! I'm so happy for you! I love your second change outfit- so chic!! And custom tees and door signs- you're the coolest bride ever! Amazing photos. Looks like the perfect wedding! 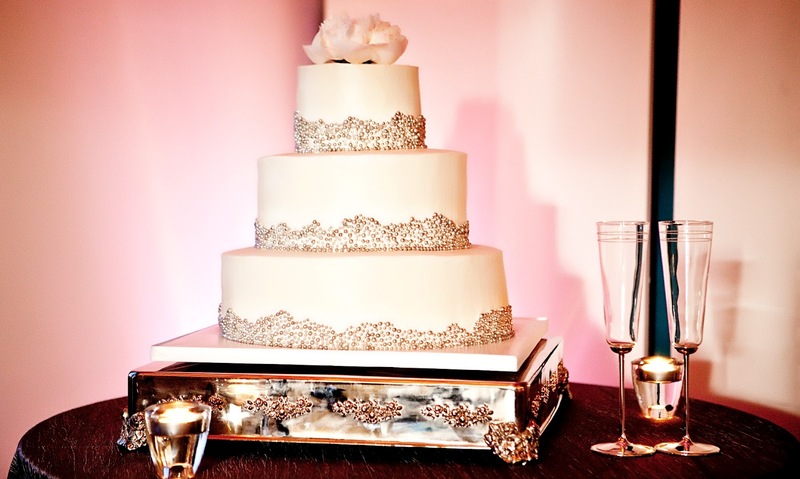 The wedding cake is so beautiful and I bet it tasted delicious!! Amazing photos. You are so beautiful!! wow, you were a stunning bride!! looks like such a amazing time, some of the photos brought tears to my eyes and I don't even know ya!! you look amazing on the pics.and everything around your wedding looks great. congrats!!! Wow! Wow! Wow! everything looks so beautiful! Anna, these pictures have all been so beautiful! I remember you talking about your dream wedding when we were interning together years ago and I'm so happy to see that your big day was as special as it was! Congratulations and thanks for sharing all the juicy details! I love love love what you did with the table runner, such a creative alternative! The decor is stunning and classic. Memories that will last you a lifetime. Absolutely AMAZING! yOU are gorgeous! Veryyy nice blog:X:X i follow u! What do you say aboutr follow each other ?? It looks like you had an amazing day! You looked absolutely gorgeous!! I love the idea to replace the guestbook with this pretty framed picture. 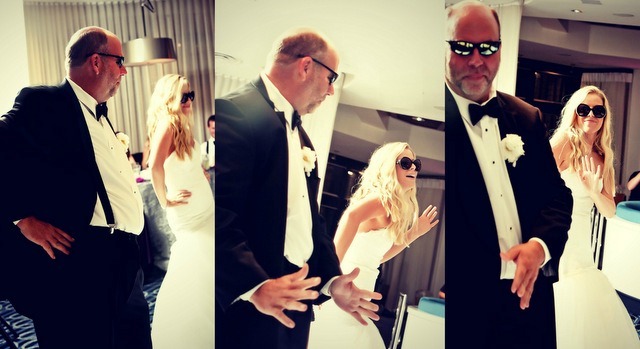 Such amazing photos - it looks like you both had a really fun magical wedding day! I love the idea of having guests sign a family tree and would definitely love to do a choreographed father/daughter dance when I get married! Completely gorgeous Anna. If I have a wedding even half as beautiful as yours I'll be happy. You are one beautiful girl inside and out. What a fairy tale wedding!! I absolutely love the pictures and stories to accompany them. You were so creative and looked gorgeous!! I LOVE all 3 of your latest posts, you were such a wonderful bride! your photos are so touching! i just love how it all looked.. So happy for you, hun! Absolutely adorable! I loved the door signs. so fabulous & beautiful :) congrats! Blown away with how beautiful everything was. Congrats. Gorgeous cake and the photo booth is awesome!! Such great pics to have forever!! you are a beautiful bride! congrats again! AMAZING POST:) and you are beyond beautiful.... Your blog is so wonderful and I will happily follow. I am so happy that you have posted your wedding pictures. They are so cool and I live seeing them. You planned a beautiful wedding- one to be jealous of! Congratulations - lovely wedding and you look absolutely beautiful! Beautiful photos, looks like you had an amazing day. I only hope my wedding is as beautiful as yours! Wonderful post and pictures I wish you the best on your new adventure. such a wonderful wedding! I love the style of the cake! Woo this is just amazing ..looks like coming out of fairy tale or something passing before eyes like a movie.. Many congrats on such a beautifully arranged day! thanks for your comment ... I love your wedding pics, gorgeous ! i love this! you look gorgeous. congrats! Wowzers! Incredible day - and beautiful couple! I hope every day after is just as happy!!! Congratulations!!! WOW, I honestly don't have other words! omgosh. i felt like i was partying with you. Congratulations Anna !! Everything looks beautiful ! Wow your wedding looks like it was not only beautiful but also so fun! 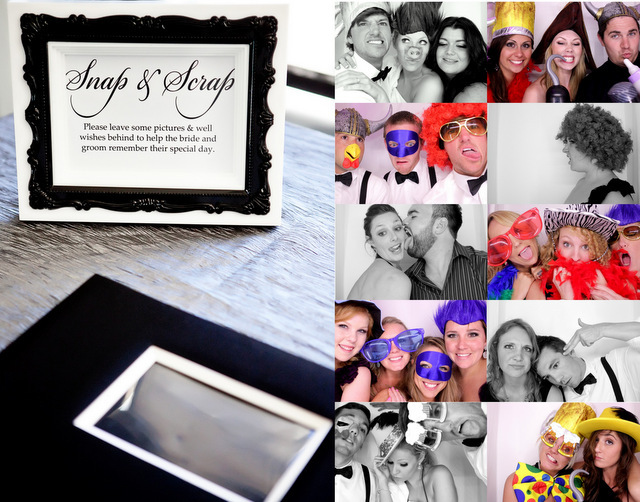 You look beaming in every photo and as do your guests! Congrats to your and your hub! Looks like you're going to have a beautiful, fun-filled and joyful marriage! Congratulations! I am so happy for you. It looks like you had a complete blast on your big day! I love your dress... Both of them. I wish you the best. Looks like everyone had a ball. Congrats. Your wedding looks like it was fun but also incredibly beautiful! You look stunning in all of the pictures and both of your dresses were spectacular. Congratulations once again on your beautiful wedding and wish you all the best! omg, your wedding looks effing amazeballs!!! everything from your wardrobe to your tablesetting to your dances looks perfect! congratulations!! BEAUTIFUL wedding! We have very similar taste! I will definitely be pinning some of these pics to my Pinterest Wedding Inspiration board! Just lovely!